The Blue Jacket Gives Me Goosebumps. From The BlogA Sunday Thought The Blog ag The Blue Jacket Gives Me Goosebumps. I thought I would write a few words about my past week adventure. It was good for my soul. You see, I was a sponsor for the Bridgeport FFA chapter as they attended the Nebraska State FFA Convention in Lincoln, Nebraska. While sitting with the kids in the first session that we attended, I thought of the years that I attended Wyoming State FFA Convention. Even thou years are past, I still get goosebumps seeing a sea of blue corduroy. The sea of blue makes me appreciate all that FFA did for me. I am pretty sure that I would not be the person I am today, if I hadn’t wore the blue jacket. I am thankful. When we are born, our only fear is falling and fear of loud noises. As we grow, we learn other fears. A good leader has appreciation of others. A good leader has a good attitude. We need to find out what people LOVE. We may not know this, but we have people that need us everyday. Leaders are the ones that are making sure everyone is succeeding. We need a little humor everyday. HA HA. We need to laugh more. We have to jump over obstacles. The future of Agriculture is not dying. I sat in on some of the competitions, I am so proud of the youth that are standing out and preaching what they believe. There was over 4000 Nebraska FFA students attending the state convention. Coach Riley (the new Nebraska Football coach) is a just as human as I am!! Being a high school Sponsor is a little stressful, takes talent, and rewarding. FFA Advisors are Special people. They truly need more recognition than they get. I am thankful that we can choose what we want to be. As I looked around at the sea of blue, I thought that we have choices, we get to choose what we want to be. I am thankful that the younger generation get to choose what they want to be. Thank you Bridgeport FFA for allowing me to be your Sponsor!! I still get goosebumps about the FFA! I am going to close my blog today with a poem from the guy that spoke at one of the sessions. 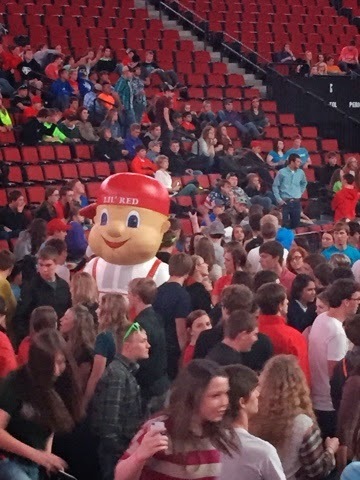 Lil Red was at the Dance!